Doing your toddlers hair doesn't have to be a daunting task. Zion has a head full of curls that I'm teaching her to love and embrace. This is why I haven't straightened my hair this year. I've been on my own natural hair journey for a couple years now, and I'm learning how to do my own hair after 20-something years of weekly appointments at the salon. Each hairdresser telling you how you should be doing your hair, wanting to "heat-train" your hair, perm it, or charge exorbitant fees for simple styles. Luckily, I've never had a perm, but I have fallen victim to heat damage, hair breakage, and outdated stylists that don’t know new techniques or products for my 4a/4b hair (if you’re into hair typing). I don't want Zion to grow up not knowing how to do her hair, worrying about straightening it, and not embracing her hair just the way it is. Here is a guide to Zion's wash day that takes about 30 minutes, depending on if she sits still or not. I prep her hair for washing with the INSPIRE pre-poo and let it sit in her hair while I prepare to wash her hair. This pre-poo is great for moisturizing and detangling prior to the shampoo if her wash day is overdue. I wash her hair twice with Shea Moisture Mango & Carrot Kids Extra-Nourishing Shampoo rinsing with warm water. Shea Moisture has great products despite the controversy. I condition her hair while I finger detangle with Shea Moisture Mango & Carrot Kids Extra-Nourishing Conditioner, then rinse with cool water. Then I section her hair and detangle with As I Am Born Curly Argan Leave-In Conditioner & Detangler with a wide-toothed comb starting gently at the ends. This is the only leave-in conditioner I’ve tried on her hair, but it has worked well. Next, I’ll probably try The Mane Choice Green Apple Fruit Medley Detangling KIDS Leave-In Conditioner because I’m curious about their kid's line. I personally haven't tried their products yet. I use Shea Moisture Coconut & Hibiscus Kids Curling Butter Cream or Cantu Care for Kids Curling Cream to style her hair and Cantu Care for Kids Styling Custard to make it last all day. All of Cantu’s products are quality and inexpensive. I use a soft bristle brush to slick her hair back in a high puff or if she’s going to bed right after I wash her hair, I put two French braids in her hair. (Her hair is thick, so it takes about 10 hours to air dry. In the morning, it’s usually still damp and easy to style. When I freshen up her hair daily, I use the Shea Moisture Coconut & Hibiscus Kids Extra-Moisturizing Detangler or the Cantu Care For Kids Conditioning Detangler along with either the Shea Moisture or Cantu curling cream and the Cantu custard. Always use kid-friendly products for your young one because they are gentler on their young hair and if soap gets in their eyes it won't be as irritating to them. 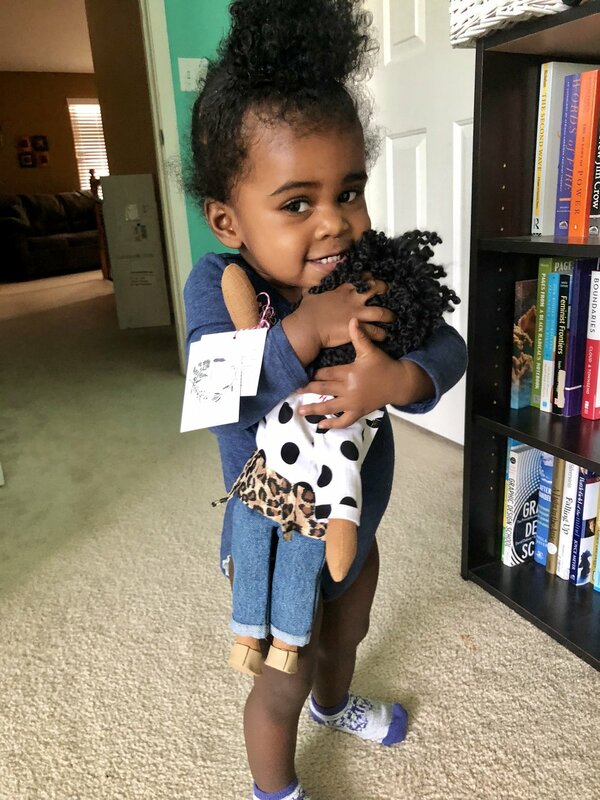 I usually style her curls in a high puff, pigtails, or braids and try to remember to take her hair down before I put her to sleep. I usually don't use oils in her hair because it weighs it down (she has thick 3a/3b hair) and I use quality hair products with natural ingredients and oils infused in them to provide long-lasting moisture and health. I usually wash her hair every week to week and a half. Zion’s hair routine won’t work for everyone, so do what works for your toddler!